A former special inspector who accused the presidential office of conducting surveillance of private citizens appeared on Tuesday to answer prosecutors' questions related to a complaint filed by the president’s office that he leaked state secrets. 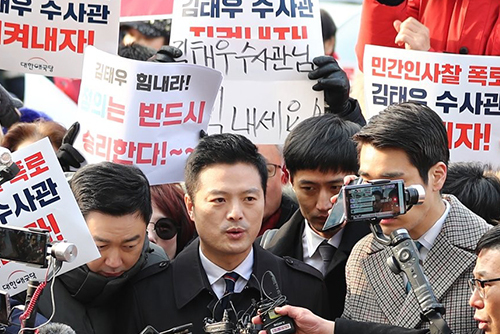 Before entering the Suwon District Prosecutors' Office at around 10:00 a.m., Kim Tae-woo said he blew the whistle on the office's illegal activities including civilian surveillance, the creation of a blacklist, and abuse of authority. Kim said he had to reveal the information in an effort to restore normalcy to state operations, adding his actions did not hurt national interests in any way. He also asked the people to judge fairly whether his actions were justifiable. In addition to his phone and e-mail records, prosecutors seized files from Kim’s office, personal residence and vehicle, and plan to verify how he gathered the information and whether or not what he revealed can be considered state secrets.